For some reason, I always pick up little stools at rummage sales and thrift shops. 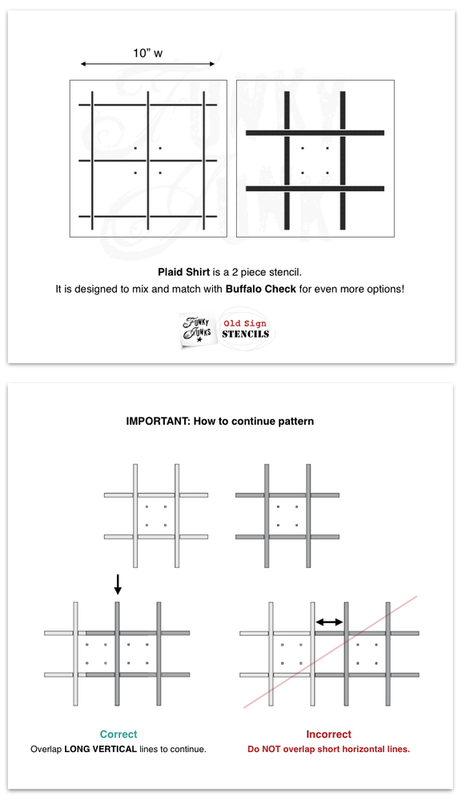 I want to try out a new stencil from Old Sign Stencils called *Plaid Shirt. These little stools that I picked up for a dollar or two will be great practice pieces. To prevent any stain bleed through, I sprayed the two stools with Zinsser Clear Shellac Spray . 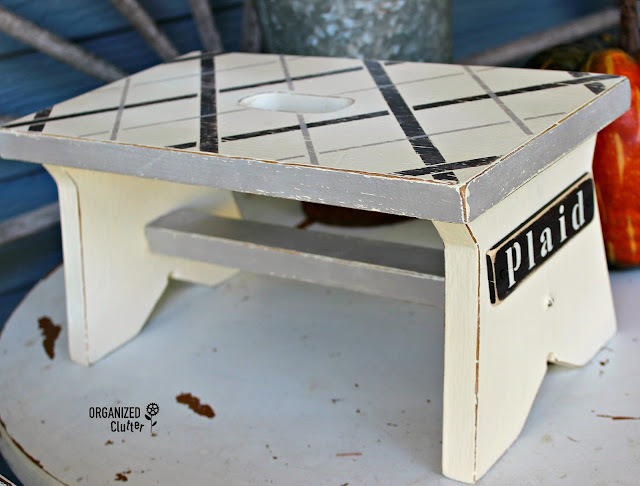 I first base coated the little rectangular stool with Rustoleum Chalked Paint in Chiffon Cream . 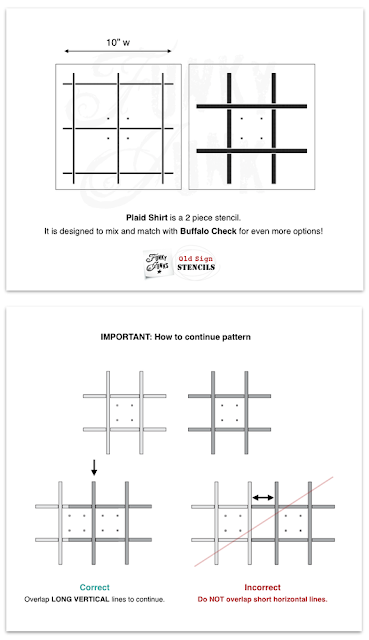 The Plaid Shirt stencil is two pieces. 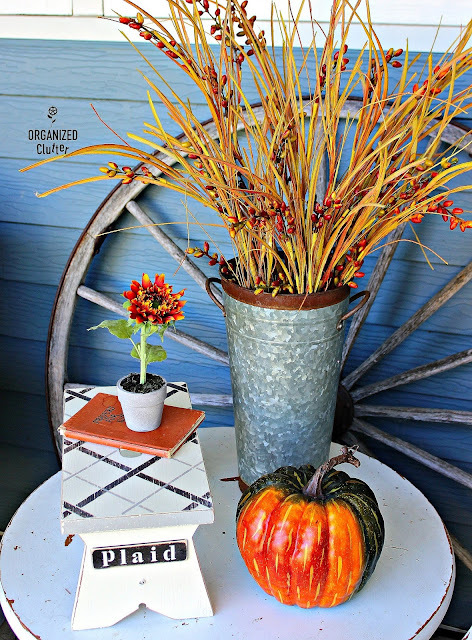 I started with the fatter lined stencil and pounced on Ceramcoat Acrylic Paint in Walnut, and I stenciled the slimmer lines with Waverly Inspirations Paint in Mink. I painted the top edges of the stool with the Waverly Mink paint too, and the cross brace. 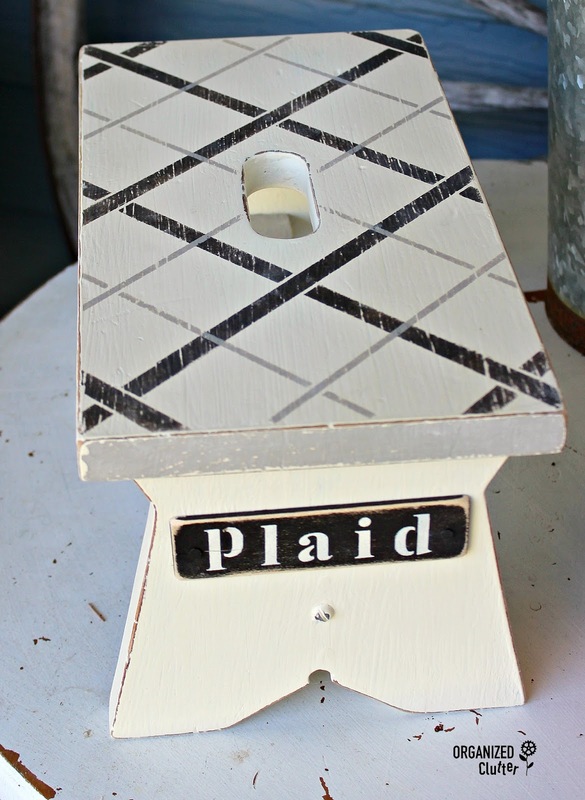 The "Plaid" stenciled sign is part of a free paint stir stick cut off and sanded on the edges and corners. I base coated it with the Ceramcoat Walnut Acrylic Paint and stenciled on "Plaid" with Momenta Alphabets and Numbers Adhesive Stencil . 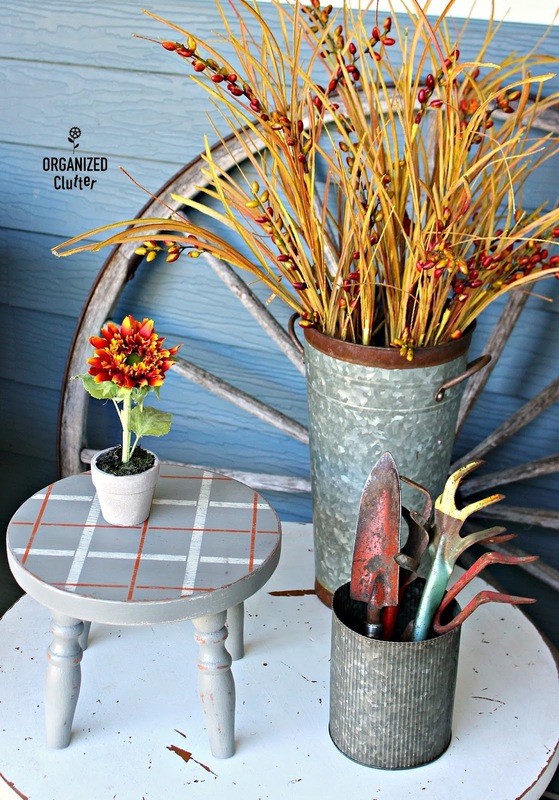 The stencil adds so much fun to the little stool! You can see I distressed the edges with sandpaper. 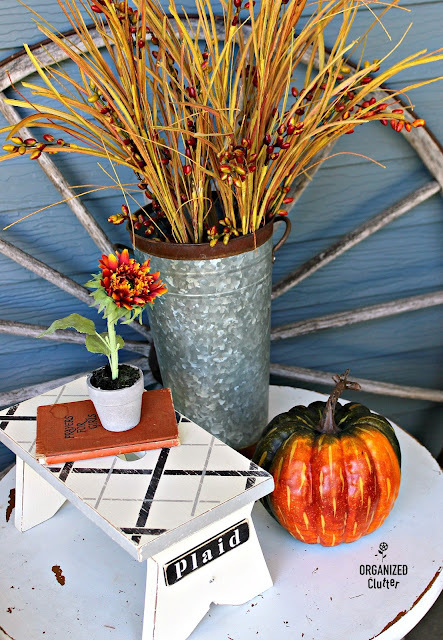 The paint colors on the stool are very neutral, but work so well with fall decor (or year round decor too). The little round stool was painted with Rust-Oleum Chalked Paint Country Gray . I also used the Plaid Shirt stencil from Old Sign Stencil on the top. 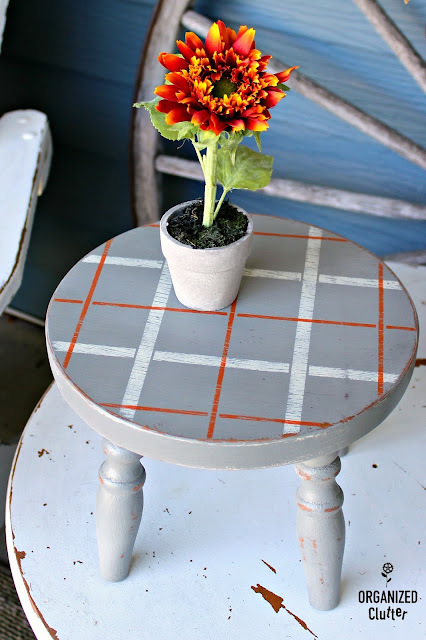 My plaid stripes were stenciled with Ceramcoat -Terra Cotta and Ceramcoat Acrylic Paint in Light Ivory. I sealed both pieces after light sand paper distressing with Krylon Matte Low Odor Clear Spray . This stool also works well for fall vignettes but would work year round as well. 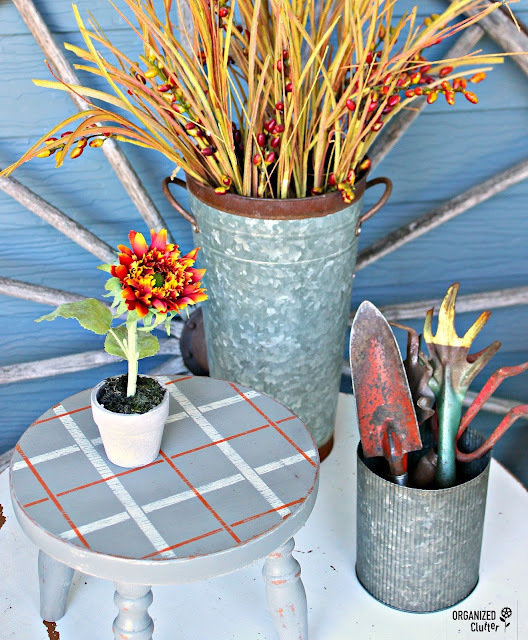 Rummage sales and thrift shops are loaded with decor possibilities! Take another look! Love the extra "plaid" sign you made. It almost adds a snicker to the stencil! Love the tones of that ceram coat! Nice plaid stripes! Soooo lovely! Just stoked you taking these plaid stencils to a level all your own Carlene! Adoring the tones you've used. I mean, how can a plaid not look good?! Gorgeous! Love this! The crossed lines add so much interest & love that plaque too! Isn't it amazing what paint can do for a piece? Great job.